Cruets, tiny bottles and mugs. I have been busy making pots in my studio and I wanted to share a bit of what I’ve been up to. I’ve been really pushing myself lately on new forms, new clays and new surface treatments. I’m really excited about the new pieces. I love this part of the process. I put my energy into designing, problem solving, trying to have the new work make sense in the presence of the other pieces. (and having many failures on the way to the successes). To balance out these time intense pieces (and often less than stellar success rates), I’ve been making a lot of smaller pieces: cruets, tiny bottles and tons of mugs. I can’t believe how many mugs I’ve been making lately! The smaller pieces are also tests of clay bodies and surface treatments. 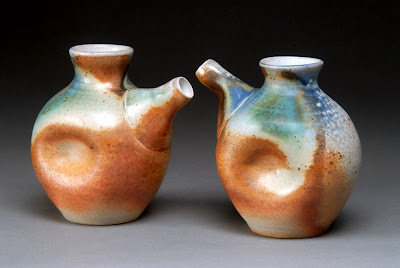 A duo of cruets with a nice squeeze that fits perfectly into your hands. A grouping of tiny bottles. I love making tiny little bottles and vases. The tallest one is about 3″ tall. 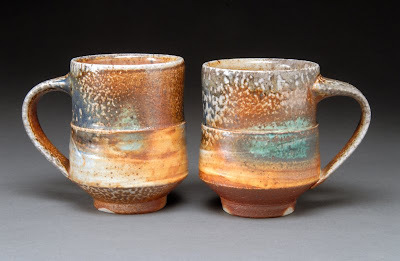 A duo of mugs with a nice thick slip applied and a highlight of glaze. Lined with a shino. Spring always makes me crave color and I find it actively finding it’s way into and onto my pots this time of the year. I love the curves of these mugs. The curves are perfect for cupping your hands around after your coffee, tea or cocoa has cooled a bit. 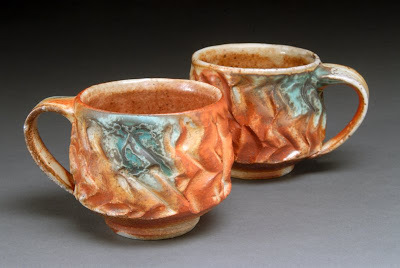 These mugs were made with a curly wire and then dipped in slip to soften the edges. They are also lined with shino and highlighted with a sprayed glaze on the outside. These my mid-western mugs. I always want to attach the word “mid-western” to any of my pieces that have straight, clean lines. Pieces that are simple and approachable. But that is my perspective as a native New Englander who has been a mid-westerner for the last 13 years. On a totally different topic, Ron Philbeck has an incredible story on his blog that you really should read! I love the ‘squeeze’ idea, cool. 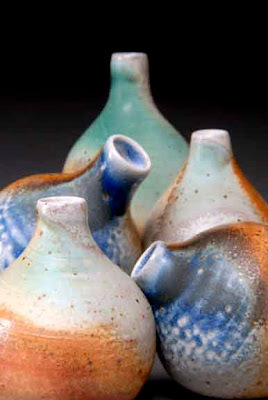 Love the cruets and tiny bottles – plus how you’re exploring different clays, shapes etc. pots look great. 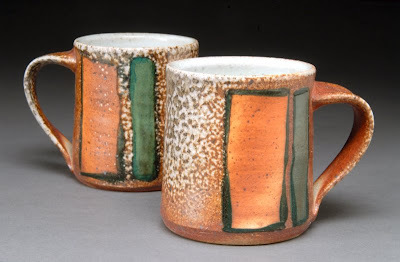 i love the color on the curved mugs! 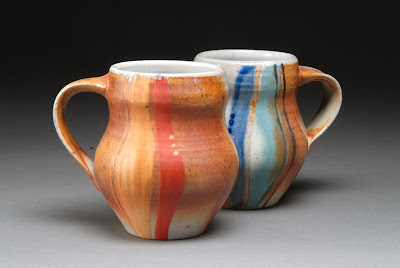 hi I’m really taken with the 2nd pair of mugs nice form..
Love the curly mugs and the colors you’re using. Great story from Ron Philbeck too. Can’t wait to see your larger pieces. mmmmmm.. those are really nice colours!– Are they sprayed on? The ones that look like they’re sprayed are sprayed… the rest is either dipped or brushed on slip.